Another jaw dropping image. Beautiful....beautiful colors and outstanding execution. I look forward to seeing what you come up with probably more than anyone on the site. 'Food and Drink' and 'Military'?!? Lovely! Congratulations on your top 12th place. Lovely picture. Congrats on your top 20 finish! 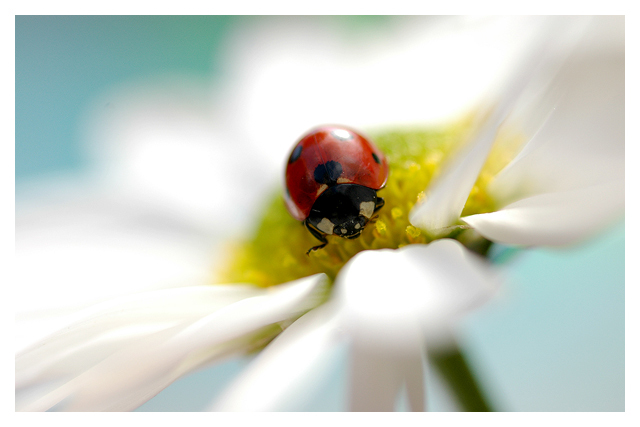 oohh...I do so love ladybugs!! I'd gladly give up all my ribons to produce the stunning shots you do day in & day out - and I do mean that in all seriousness!! Congrats on the the high finish! Beautiful, artistic approach--pure Dax. :) Congratulations on a great finish. Beautiful photograph. I like the lighting. Great contrast. I vote a 9. A perfect use of contrast, not too subtle not too dark. To me it is the best photo in this challenge. Excellent! The dof softens the high contrast and unifies the entire photo. Lovely shallow depth of field, lovely composition, wonderful contrasting colours! Beautiful! I love this picture, the colors, the DOF, the subject. Very nice. This deserves a ribbon. Well done. I like this a lot. I think the extreme DOF really leads us to the subject. Some might say there's a lack of contrast. I say 8! I actually like the DOF on this picture. Some may dock you for it though. Proudly hosted by Sargasso Networks. Current Server Time: 04/24/2019 02:30:28 AM EDT.